This guide contains creative ways to ask a boyfriend to a dance. 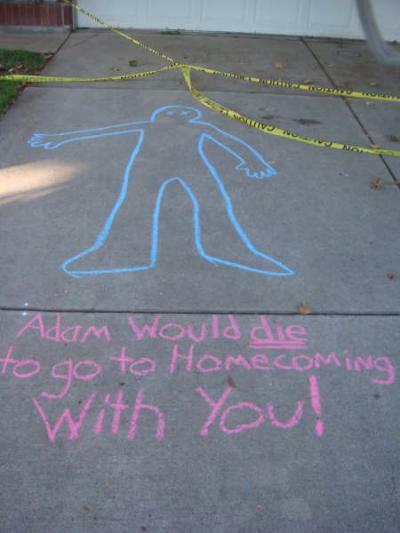 Finding a creative way to ask your boyfriend to a dance is sure to make the event more memorable. Here are so great ideas to consider. Please give me some cute original ideas on how to ask my boyfriend to my girls choice dance! I want to do something that hasn't really been done and I'd like to be creative. I'm usually a really creative girl and I think my guy expects something cute! He wouldn't be mad if i didn't do it creatively, but how fun would that be? Sorry this is so late but maybe it can help later. I don't know what he is like, but have you ever had a perfect moment with him? You could recreate that really special moment that he remembers and then say something like " After all you have done for me, the only way I would ever feel like I repaid you is if you would go to the dance with me." I know it doesn't sound creative, but its sweet. Hopes it helps! 1) Get a small pumpkin. Put your name on a small piece of paper and put tape around it so it won't get ruined when wet. On the outside of the pumpkin write "it would be 'smashing' if you would go to [the dance] with me" in order to find out who is asking, they have to smash the pumpkin! 3) Buy a puzzle, put it together, and turn it over. On the back write "it would be 'puzzling' if you didn't say yes to [the dance] with me!" take it apart and put it back in the box! Ok this I thought was adorable! Go to the store and get as many Hershey kisses as you can find! Pour some on his walk way to his house, pour more goin into his house pour more goin into his room, pour alot all over his room and but a huge poster board on his wall that says "Now that I have kissed the ground you walk on, will you go to _____ with me?" Tolo is coming up at our school and I want to ask my boyfriend to the dance in a crazy, creative way. We've been dating for a while and he's a little shy and doesn't really like a lot of attention on him. So as a joke I told him one day that I had a huge plan to ask him to tolo, and now he said he really wants to see it! Can anyone help me out here? The crazier, the better. Get a box and some pink helium balloons. Draw pig faces on the balloons and on the box say "I'll ask you to tolo when pigs fly" so when he opens the box, pig balloons fly in the air. Please give me some cute original ideas on how to ask my boyfriend to my girls choice dance. I want to do something that hasn't really been done and I'd like to be creative. I'm usually a really creative girl and I think my guy expects something cute. He wouldn't be mad if I didn't do it creatively, but how fun would that be? Spell it out in Candy conversation hearts? Bake a cake with it in writing like an invitation? Or wrap an invitation up in plastic and place it between layers in a cake (giving him that piece of course). Give him a bunch of blown up balloons that he has to pop with the note/invitation written on separate pieces of paper and he has to put it together like a puzzle? Or write it on a balloon or two and have him blow them to read what it says? I did this one my sophomore year and everyone loved it. Okay, you cut out a bunch of different colored stars from construction paper and make them big. Tape them all over his walls and ceiling, then you take a couple bags of star burst and throw them all over his floor. On a big poster board tape it on his door saying "The stars would burst if you went to ____ with me." Then you get a big card and write "I lay this letter on your bed, to help you find my name all in red!" (place that on his bed). Then you write a letter of your name on a red starburst and he has to look through all the red to find all the letters and put it together. He had his little brother come to my house dressed as an old fashioned delivery boy. He gave me a package. When I opened it, it had the Harry Potter #4 (?) book with a page marked. The bookmark said that in the marked pages there was a hidden message. I read the pages, and it was the part where Harry asked Cho to the Yule Ball. So if you like a boy that loves Harry Potter, or books or something, this would be a cute way to ask him. My friend called a radio station and asked his girlfriend to the prom over the radio. "Will _______ go to the dance with ______?" My boyfriend asked me out by sticking a pack of gum in my locker lock. The pack was all empty except for one piece and, when I pulled the piece out there was a piece of paper wrapped around it asking me to the dance. He didn't write his name so I was confused, and I turned around and he was there and asked me again. Get a box of chocolates, and write a note that says; "will you go to_______with me? If your answer is yes, eat the chocolates and return the box. If your answer is no, eat the box and return the chocolates!" What you could do is get a fishbowl full of golden fish, then buy one little black one (or one that stands out) then write, "Out of all the fish in the sea, I want you to go with me to ______!". I got a build a bear and dressed it up in a tux and put a voice recorder in it that said, "Will you go to turnabout with me _______?". I put the bear on a table at his house and then made a heart, then my name out of Hershey kisses :)! Okay, there are a TON of cute things on this page and here are two that are pretty cool. Order a pizza to be delivered to his house and give the delivery guy a note from you on the inside flap of the box. Then when he opens up the box he finds a pizza and also your invitation. If he doesn't say yes, then he is crazy! And this one is kinda corny but it's cute if you like it. Okay, so this is kinda cheesy but what if he likes candy or something there are 3 different ones to do. Swedish Fish- Start by getting a whole bunch of Swedish fish and lay them out in his room or locker or wherever, then you put a sign that says "You're the Swedish Fish in the sea, will you go to MORP with me?" Starburst- So, again you put them in his room or locker and you put starburst everywhere and say "My stars would burst if you went to MORP with me." 100 grand- Again with the locker and room you put 100 grands everywhere and have a sign that either says "I'd give up 100 grand if you would go to MORP with me." Or you put 10, 100 grands and say"I'd give up a million to go to MORP with you." One way I asked a boy to a dance was to do a little scavenger hunt around town. That's exciting and fun for both you and him :) To make it more exciting, get lots of people involved. Make your soon to be date have to complete tasks to receive the next clue. "Heads we go to ____(dance), tails you flip again." Get a plunger and tape Almond Joys on it and say, "I would be overfilled with joy if you went to MORP with me"
We had homecoming coming up, it was two weeks away and my boyfriend hadn't said anything about the dance to me. I knew we were supposed to go with our friends but he hadn't mentioned it once. When I brought it up he ignored me and changed the subject. I started to get really frustrated with him. So one day I said, "If you don't want to go just let me know, because then I have to cancel our plans I made with everyone!". Again he ignored me. That night I was pretty upset and then at 4:30 in the morning my mom comes in and is yelling, "Alexis you need to get up! I need to get to work and your friends have made a mess again in the front yard".